Aprecie o cenário sublime e os fascinantes mercados indígenas da Guatemala durante esta viagem de um dia a Chichicastenango e ao Lago Atitlán saindo da Cidade da Guatemala ou Antigua. Confira a cidade montanhosa de Chichicastenango, lar de uma comunidade de moradores indígenas, um mercado colorido e xamãs locais realizando antigos rituais maias. 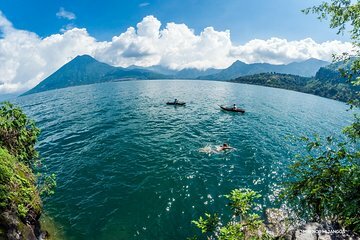 Você então explorará as margens do Lago Atitlan, um lago único cercado por uma coleção de magníficos vulcões. Esta viagem de um dia a Chichicastenango e Lake Atitlan inclui um guia e transporte de ida e volta ao hotel. We had Andrew for a guide. He was able to converse in Spanish and English which was necessary for our group. We visited the Chichicastenango market for an hour plus or minus my guess - it was so interesting that I didn't keep track of the time. Andrew told us about the history of the market and the two churches near the market - very knowledgeable. Gave us time to look and negotiate with the vendors. We had a late lunch at the Lake and had the option to walk down to the lake. On the way back, we took a quick drive through Panajachel. The driver, Jose, had excellent driving skills which were necessary on the InterAmerican Highway. We saw lots of villages and Andrew always had an answer to our questions.About 6 hours total driving time from Antigua and probably a couple more from Guatemala City. The total time for our trip was about 10 hours from Antigua to Antigua. The lake is absolutely stunning, probably a must-see when in Gutemala.